Keep reading to learn more about how Americans move across the country or across town. 1. The average American moves 11.7 times in his or her lifetime. 2. However, the U.S. Census Bureau found the percentage of people who moved in 2016 was historically low. Just over 11% of Americans made a move that year. 3. In total 314,992,000 people moved in the U.S. during 2016. 4. Ladies move more than guys. In 2016 6.6 million more females moved than males. 5. The largest age group for movers is 18-34 years old. Within that group 25-29 year olds moved the most. 6. The U.S. Bureau of Labor Statistics found that 3 out of 10 college graduates move out of their alma mater’s state within five years of graduation. Furthermore, 35% of college grads don’t live in their home state. 7. According to surveys from the U.S. Census Bureau 42.2% of people make a move for house-related reasons, 27.4% of people move for personal reasons, and 20.2% move for employment-related reasons. 8. The #1 reason for making an employment-related move: wanting an easier commute. 9. More people moved to Texas than any other state in 2016. But Utah, Nevada, Idaho, Florida and Washington had the highest overall population growth. 10. Friday is the most popular moving day of the week. That is unless it falls on the first of the month. Most people choose to move mid-month. 11. Sunday is the least popular moving day. By then all the Friday movers are settled into their new homes. 12. Half of all moves happen between May and September. 13. Household moves typically include about 6,500 pounds worth of stuff. 14. 60 Boxes: that’s the average number used for a move. 15. 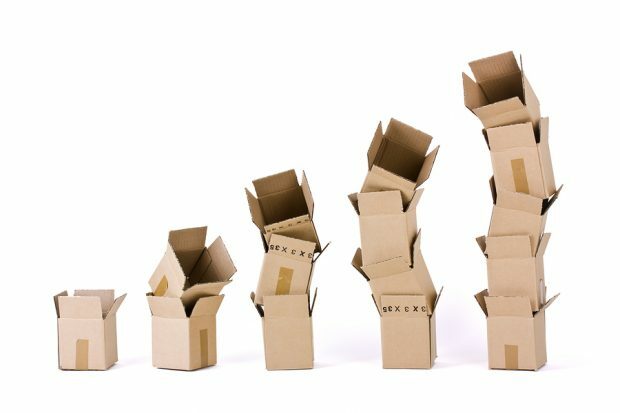 A cardboard moving box can typically be used 3-10 times before it’s no longer structurally sound. 16. Americans believe that moving is the third most stressful life event after a death in the family and divorce. 17. Professional movers are required by federal law to supply all clients with the booklet Your Rights and Responsibilities When You Move. 18. It’s against federal law for a moving company to withhold a person’s personal items. 19. Luanda, Angola is currently the most expensive city in the world to move to, followed by New York City and San Francisco. 20. The least expensive time to move is during the winter, because it’s the least popular time to move. Our team also knows a lot about how to make a move as stress-free as possible. Call us today for more moving tips or use the online form to get an instant moving quote!